Observational studies link high whole grain intakes to reduced risk of many chronic diseases. This study quantified whole grain intakes in the Irish adult population and examined the major contributing sources. It also investigated potential dietary strategies to improve whole grain intakes. Whole grain intakes were calculated in a nationally representative sample of 1500 Irish adults using data from the most recent national food survey, the National Adult Nutrition Survey (NANS). Food consumption was assessed, at brand level where possible, using a 4-day semi-weighed food diary with whole grain content estimated from labels on a dry matter basis. Mean daily whole grain intakes were 27.8 ± 29.4 g/day, with only 19% of the population meeting the quantity-specific recommendation of 48 g per day. Wheat was the highest contributor to whole grain intake at 66%, followed by oats at 26%. High whole grain intakes were associated with higher dietary intakes of fibre, magnesium, potassium, phosphorus, and a higher alternative Mediterranean Diet Score. Whole grain foods were most frequently eaten at breakfast time. Regression analysis revealed that consumption of an additional 10 g of whole grain containing ‘ready-to-eat breakfast cereals’, ‘rice or pastas’, or ‘breads’ each day would increase intake of whole grains by an extra 5, 3.5, and 2.7 g, respectively. 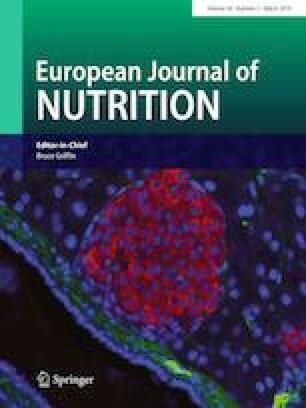 This study reveals low intakes of whole grains in Irish adults. Recommending cereals, breads, and grains with higher whole grain content as part of public health campaigns could improve whole grain intakes. This work was funded by the Irish Government, Department of Agriculture, Food and the Marine under the ‘Food for Health Research Initiative’ 2007–2012 and Project 13 F 542—National Nutritional Databases for Public Health and New Product Development. AF and MJG were original grant holders on the National Adult Nutrition Survey. AF and JW contributed to the design and execution of the study and provided expert advice throughout. NFD and COD carried out the data analysis and wrote the first draft. BAMcN and APN contributed to the design of the study, data analysis, paper editing, and review. MB contributed to data analysis and review. All authors critically reviewed the manuscript and approved the final version submitted for publication. This study was approved by the University College Cork Clinical Research Ethics Committee of the Cork Teaching Hospitals and the Human Ethics Research Committee of University College Dublin (ECM 3 (p) 4 September 2008) and performed in accordance with the ethical standards laid down in the 1964 Declaration of Helsinki and its later amendments. All persons gave their informed consent. APN and MJG have previously received unrestricted research funding from Cereal Partners Worldwide, with no influence in the current analysis or study. There are no other conflicts of interest to declare.